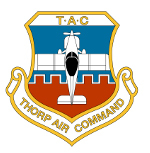 Thorp Air Command - T18.net • View topic - How to locate the holes in the bulkheads for rudder cables? How to locate the holes in the bulkheads for rudder cables? Post subject: How to locate the holes in the bulkheads for rudder cables? So, my fuselage is built and I'm ready to install the rudder cables. I want to install the rudder cables in the "outboard' position which runs along the side skin of the fuselage. I realize that from the rudder pedals to the baggage area, I will need a couple of pulleys, to get the cable routed along the side skin, but once I get the cable to the baggage are ........How do I know where to drill the hole in each bulkhead from the baggage area all the way back to the the most aft bulkhead so that the cable will run all the way through the bulkheads to the rudder attachment in a straight line? Am I over thinking this? I don't want a bunch of different sized holes in each bulkhead because I mis-drilled my rudder cable hole in each bulkhead. I have seen the retro-fit install suggested by Bob Dial in the newsletters that take the cable inside of the bulkheads, but I want to try and go through the bulkheads if I can. I would really appreciate any photos anyone could post (or email me) of your rudder cable installation showing the pulleys, and how they were attached to the airframe. Thinking about this, run two strings from the rudder up through the center of the fuselage to the rudder pedals, using a straight edge across the strings mark hole on the bulkhead ?? To add to Bill's idea, run a string down the clear space offset a known distance from your intended routing. Measure offset over to the bulkhead. Drill holes. Make the holes large enough for cable bounce. Line holes with plastic grommets. I have a plastic block on the dash frame with a 1/4 hole in it, the I ran a plastic conduit from the forward seat attach right over the heavy angle to the aft baggage bulkhead (forget that BH #). if you look at where the cable attaches to the pedal it's right at the heavy angle .. no need to complicate things too much. The HA should be straight and you'll want the cable right on top of it. OK, thats all good stuff. Thank yall! I think I can get it done with that. Might try popping a string/chalk line to locate the holes. Also, my bird has the cables outside. Because the fuselage, and hence the cables through the bulkheads is not a straight tangent, there will be wear through whatever "bushing" for lack of a better term that you put in the cable hole, as the cables naturally want to be straight with tension - my bird had delrin blocks riveted to each of the bulkhead holes with the cable running through it purposed to negate/lesson the friction. I noticed the delrin was beginning to wear down to the metal which of course you do not want abrading your rudder cables. Solution: take 1/8 inch polyethylene tubing and wrap the complete rudder cables. As mine were in place, I just slit the tube lengthwise and ran it over the cables in sitsu. Took about an hour - 6+ years ago - allbeepeachy to date.